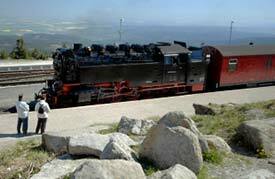 You can buy HSB train tickets at the railroad's "Dampfladen No. 6" ("Steamshop No. 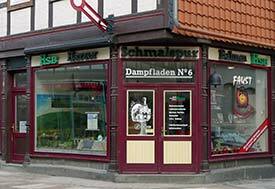 6") on the Marktplatz in Wernigerode or at any station along the line. 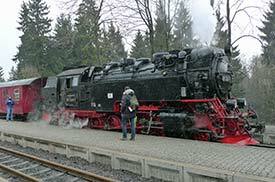 Trains on the Wernigerode-Brocken line are powered by coal-burning steam engines, such as this Neubaulocomotiv from the 1952-1954 period. 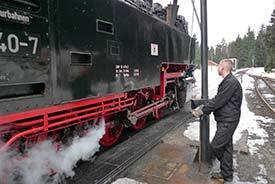 During the trip from Wernigerode to the Brocken, HSB trains stop in Schierke for seven or eight minutes to take on water. This photo was taken in early March, on a section of track above Schierke. 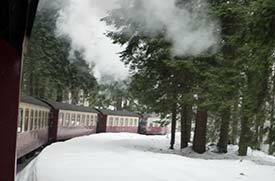 The snow was deep, and the line was surrounded on both sides by pine forests in the Brocken National Park. 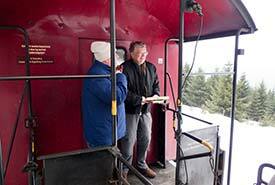 These hardy tourists braved the cold to enjoy a view from the platform of the baggage-passenger car behind the engine. 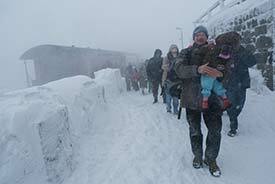 At the Brocken summit station, passengers fought their way through a 70-km/h (44-mph) blizzard to reach the hotel-restaurant and the Brockenmuseum in a former Stasi (East German State Security) listening post. 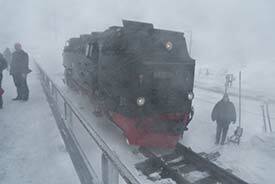 Carsten Madsen took this photo of the Brocken station during the summer months, when the weather is more benign and the views are better than they were during my early March visit. Bottom photo copyright © Carsten Madsen.